I know this is not on the Medifast plan, but I wanted to share it anyways. These can be very dangerous in the house. I even ate a brownie myself because they looked sooooo good and they were very, very good. So yeah, very dangerous, but so worth it to me. These are excellent for pot lucks that both adults and kids would enjoy. I brought these brownies to my sister in laws house because she was having a little get together and everyone loved them. It was so easy to make and did not require much time at all. The best part is that they can be made ahead of time, then frozen and then defrosted in the fridge the night before. It was a delicious recipe I found in a cookbook I got called The Cake Doctor Returns by Anne Bryn. I have all her cookbooks! 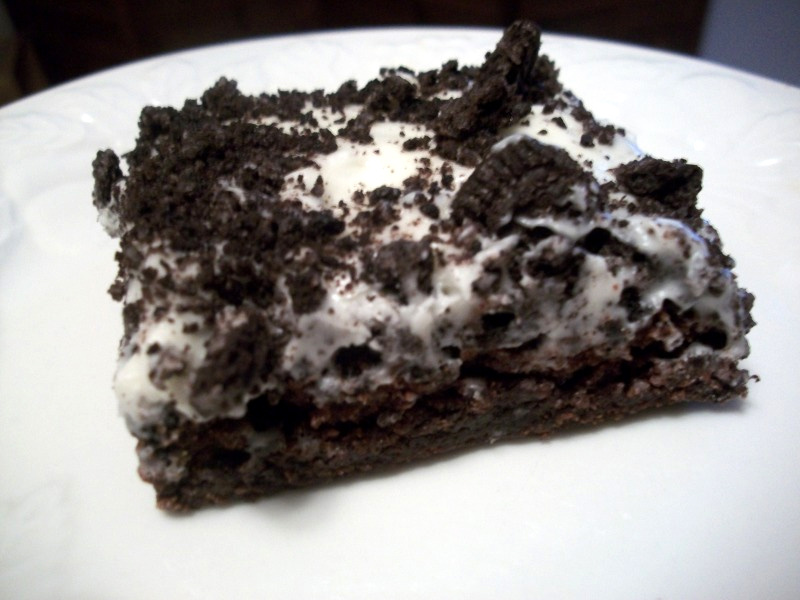 She uses cake and brownie mixes to make some wonderful and yummy desserts. If you ever need to know what to bring to a pot luck, then grab this book. It will definitely be a life savor! Preheat oven to 325 degrees. Lightly mist the bottom of an 8 inch square metal pan with vegetable oil spray and set pan aside. Place the brownie mix, melted butter, and eggs in a large mixing bowl and stir with a wooden spoon until moistened, about 40 strokes. Transfer the batter to the prepared pan and press the 1/2 cup of oreos onto the top of the batter. Place the pan in oven. Bake the brownies until edges have set and the center is still a little soft (press it lightly with a finger), 40 to 42 minutes. Transfer the baking pan to a wire rack and let cool for 20 minutes before frosting. To make the frosting, place the cream cheese and room temperature butter in a large mixing bowl and beat with an electric mixer on low speed until soft, 30 seconds. Turn off the machine and add the confectioners' sugar. Beat on low speed until the sugar is incorporated, 30 seconds longer. Fold in the 1 cup of chopped oreos. Spoon the frosting on top of cooled brownies in the pan. Using a metal spatula, spread the frosting evenly over brownies. Place the brownies in the refrigerator for 10 minutes until the frosting sets before cutting them into 2 inch square bars and serving. Store the brownies, covered with plastic wrap or aluminum foil, in the refrigerator for up to five days. Freeze the brownies in the pan, covered with aluminum foil, for up to three months. Let the brownies thaw overnight in the refrigerator before serving. This post is linked with Sweet as Sugar Cookies. Lisa hosts Sweets for a Saturday Party where different bloggers link their incredible sweet treats with her blog every week. There are hundreds of different recipes to try out so go check out her blog by clicking the button below!